Series B financing round is led by Asahi Glass, a Japanese global glass manufacturing company, part of Mitsubishi group. Co-investors are Sumitomo Corporation of Americas, Leslie Ventures and Khosla Ventures. As it happened, it was Khosla Ventures that led the first financing round A in 2016 when Arevo raised $7 million. 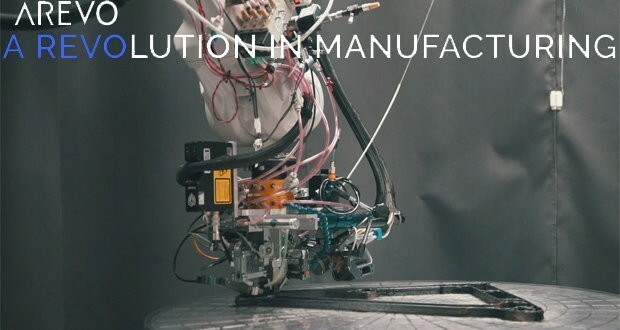 The startup was founded in Silicon Valley in 2013 by Hemant Bheda and developed three-pronged approach to 3D printing: proprietary continuous fiber 3D printing technology based on laser sintering using thermoplastic resin; a robotic arm enabling true 3D printing; and specialized software. Our technology is agnostic to type of fibers. It is possible for us to use Glass, Kevlar, Basalt etc. fibers in conjunction with Thermoplastic matrix. Our technology also allows multi-material construction. For example, we can make part made with Carbon Fibers and Basalt fibers. With its unique combination AREVO manages to create lightweight, durable and cost-efficient composite products of almost unlimited size and appropriate quantity, according to the developers. Management software can be customized to meet the customer demands; it can be updated and used to communicate with colleges and related businesses via the internet. The next financing round will help Arevo focus on the full-scale commercialization of its technology. The startup attracted the attention of both professional investors and big companies, some of them participated in the round. In 2017 Arevo made an agreement with a non-profit strategic investor In-Q-Tel, specializing in a rather specific field: it identifies innovative technology solutions to support the mission of the U.S. Intelligence Community, including the Internal Security Department, the Central Intelligence Agency and the Federal Bureau of Investigation. The next financing round coincided with Jim Miller’s appointment to the CEO position. Previously he was the top manager of Amazon and Google. Miller is committed to providing a strategy of Areo technology commercialization across a diverse set of industries such as aerospace, medical, defense, consumer electronics, and sporting goods. To demonstrate its unique approach Arevo has created a popular and understandable product, that is a bike. The bike frame is printed using carbon fiber and the total price for the finished product is $3000-$4000, commented the developers to Basalt Today. This bike offers strength and design reliability combined with light weight and fast manufacture, as well as the ability to customize frame dimensions. The other days, Time Sport International, a leading bicycle manufacturing company announced a new version of their mountain bike equipped with a carbon frame. However, the company also announced the launch of another version where part of carbon would be replaced with basalt fiber to reduce price without scarifying operational performance so that a wide audience could afford to buy this bicycle. It is possible to compare the prices of conventional and 3D-printed bikes, as well as to learn more about the traditional process to manufacture a frame by RTM method.